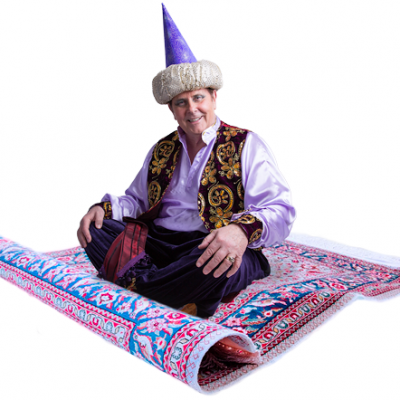 Ali Baba is one of the most in-demand children’s magicians working today. His refreshing and clever mix of comedy, magic and spectacular fancy costume returns him for repeat performances all over the world. The Ali Baba Show brings magic to your home and venue. Children and guests are sure to be entertained by Ali Baba who will bring a show that’s very creative, entertaining, and truly magical. One will be amazed by the excitement, fun and magic as Ali Baba performs thrilling & mind-boggling magic right before your very eyes. Children will be enthralled (Adults love it too). This is a must-see and spectacularly colourful show. Your best choice for children’s parties – Ali Baba offers entertainment for Children ages 5 and over. So whether your guests are waiting to be seated or enjoying a meal, Ali Baba’s magical entertainment will make your children’s party fun, exciting and memorable, with eye-catching magic tricks and hilarious routines. "There was not a single child without a smile. I even noticed our staff enjoying themselves! Ali Baba really know how to capture the attention of the audience. I look forward to future performances. " "The children were so delighted by Ali Baba. It was amazing to see how many were trying magic on their own after the show was over. Ali Baba just held the audience in captivity. We were all in awe and would highly recommend this show to everyone! " "Ali Baba is extremely professional, but very funny. Cool, fun magic show that kept my children mesmerized the whole time. I am especially a fan of the pom – pom trick and he was amazing! Ali Baba is permanently on my list. I highly recommend Ali Baba for any party. Your children and guests will be just as enthralled as mine were, and it’ll definitely be a show to remember. " "Just wanted to let you know how today went with Ali Baba. He was fantastic! The kids LOVED him, were wowed by his magic tricks and laughed a lot! I wouldn’t hesitate to recommend him. "